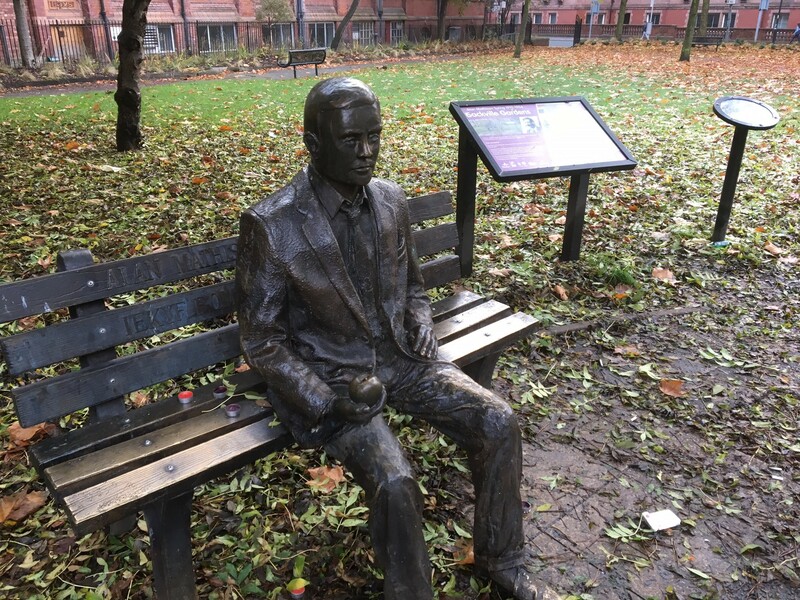 Tucked away between Manchester Piccadilly and Oxford Road train stations is a quiet – but very touching – memorial to Alan Turing. In Sackville Park (or Sackville Gardens, depending on which map you consult), a figure sits, holding an apple, on a bench. Both are cast in bronze. The relief reads, ‘Alan Mathison Turing 1912-1954′ along with an ENIGMA-style coding of, ‘Founder of Computer Science’. At the figure’s feet, a further inscription reads, ‘Father of computer science, mathematician, logician, wartime codebreaker, victim of prejudice … Mathematics, rightly viewed, possesses not only truth, but supreme beauty — a beauty cold and austere, like that of sculpture’, the second part being a quotation from Bertrand Russell. Historic court files revealing the details of World War Two enigma codebreaker Alan Turing’s convictions for homosexual behaviour are to go on public display for the very first time. The story of Alan Turing’s vital contribution to the Allied campaign during World War Two was brought to life in the film, Oscar-winning The Imitation Game. 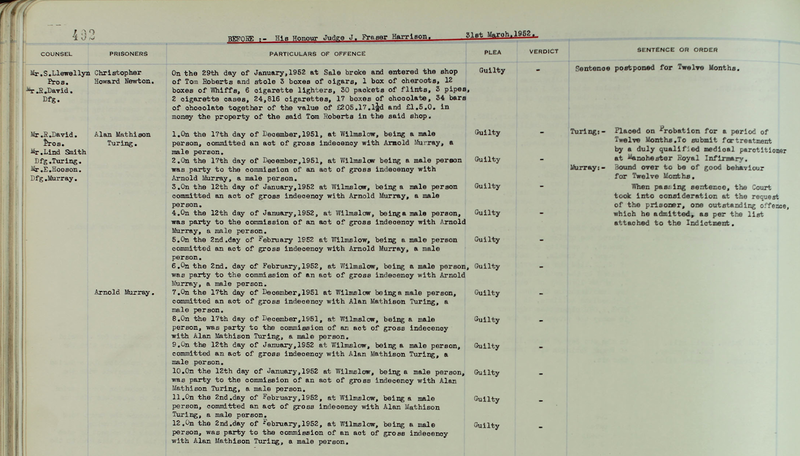 And now, the record of what followed in Cheshire’s courts is available for public viewing. This month’s post considers a little-remembered part of Turing’s otherwise famous 1950 paper on AI. Just for once, this month, let’s not skirt around the generally problematic issue of ‘real intelligence’ compared with ‘artificial intelligence’ and ask what it means for a machine (a robot, if you like, for simplicity) to have the whole package: not just some abstract ability to calculate, process, adapt, etc. but ‘human intelligence’, ‘self-awareness’, ‘sentience’; the ‘Full Monty’, as it were. Star Trek’s ‘Data’ if you like, assuming we’ve understood what the writers had in mind correctly. Of course, we’re not really going to build such a robot, nor even come anything close to designing one. We’re just going to ask whether it’s possible to create a machine with ‘consciousness’. Even that’s fraught with difficulty, however, because we may not be able to define ‘consciousness’ to everyone’s satisfaction but let’s try the simple, optimistic version of ‘consciousness’ broadly meaning ‘a state of self-awareness like a human’. Is that possible? Alan Turing’s Notebook to be Lost?